Place our thoughts in order we may start with ease. The game mechanism is based on player vs. dealer attempts to receive a total as closer to 21 points as it possible. Same time you are not allowed to run over this number otherwise you go bust automatically (the same procedure deals with the dealer as well). You place a bet, dealer distributes 2 cards for you (face-up) and for himself (only one card is shown) and the thus the contest begins. You may Stay, Hit, Split, Double, Surrender or buy Insurance. After the player turns the dealer reveals his second card also act depending on his hand total. If he has 16 or lower - then he must act. If the dealer gets 17 or more he must stay. If you get 21 total with 2 initial cards - the Blackjack is announced and you win automatically. If you (or the dealer) get more than 21 then you go bust and lose at once. If the dealer gets the same total you have - then the Push or Tie is announced. 2's, 3's, 4's, 5's, 6's, 7's, 8's, 9's value 2, 3, 4, 5, 6, 7, 8, 9 points accordingly. Surrender - you see no chances to win and exit the round; ½ of your initial bet is back to you. Generally about 6 player sits are available in live blackjack game. 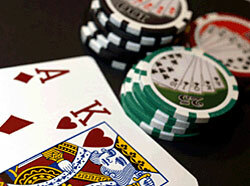 Performing casino online possesses tete-a-tete gameplay or online team playing. Basic blackjack rules allow either 6 or 8 card decks to play. The dealer shuffles all the packs together and then places them in a special box called shoe.